Christmas songs are amazing. They can bring out the spirit with the tinkle of a tune, whilst also portraying a variety of emotions within the depths of their sound. Whether it is emotional or energetic, it is truly wonderful just how varied a Christmas or Winter song can become, yet still feel like it is a part of the winter and Christmas season. Whether it is pop or rock, dance or a ballad, it seems that whatever the genre and style, you can somehow put an inkling of Christmas in there! Ah, the power of winter spirit and twinkling sounds. With a jingle and a bell, we're going to take a look at some songs that embody this idea of Christmas time, but in a few different sounds. It's time to sit by the fire, put the presents under the tree, and hum a lovely little tune as we warm ourselves with eggnog and mulled wine. This is the Third Eve, and tonight we shall enjoy the spirit and joy of E-girls and Christmas in sound. Let the bells ring out, and the merriment begin! What little ditty will you hum and sing on this winters eve..? 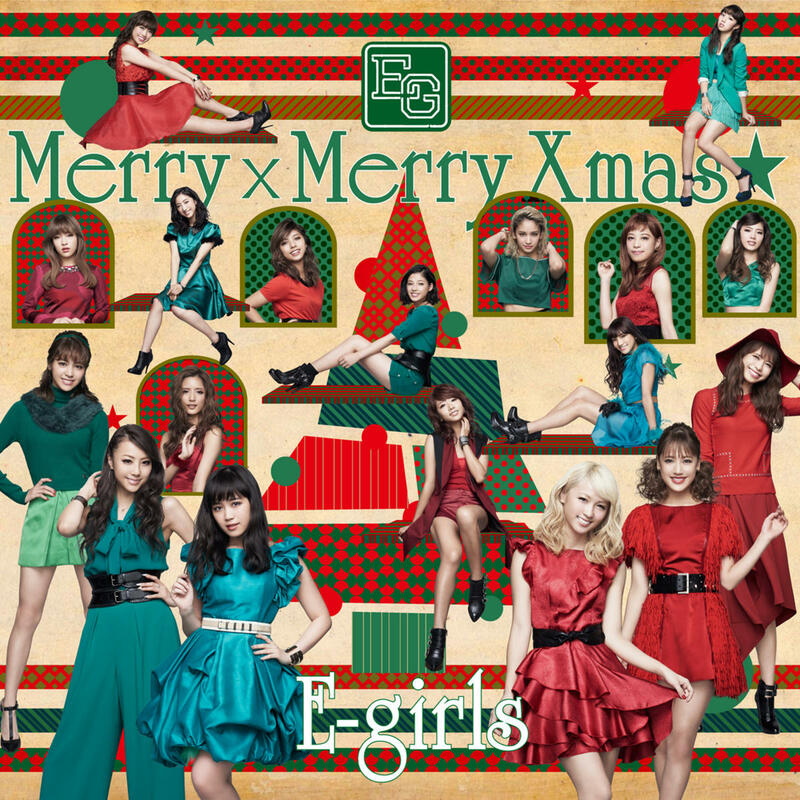 Opening this Christmas themed single, Merry x Merry Xmas★ is, of course, an energetic pop number infused with some of that indescribable E-girls magic. Upbeat and undeniably enjoyable, I really can't help but get into the Christmas spirit when I put this track on. Heck, for a good week or so, this was one of the only tracks I bothered to listen to! It's hella catchy, and it basically screams 'Christmas' and joy all around. I have to admit that, when this song first came out a year or so ago, I kind of ignored it, mostly because the music video really didn't appeal to me. It still doesn't, though I admit it's very cute, and certainly... well, background heavy, or stylish, if you will. It's also random, though and doesn't seem as focused or creative as what Mr. Snowman was. Still, it's entertaining visually, but its real power lies in the song, for me. Basically, it has all the core elements of a happy Christmas song: spirit, twinkling sounds, lots of 'Christmas' lyrics thrown about here and there, an enjoyable, almost cheesy sound, and a dose of over the top cheer. It also has a dad dance factor to it, and feels like it might be played either on the radio every year, or at Christmas discos that your folks might force you to attend. It's good for a party, and it's good for a listen or three, so when you have the chance, check this one out and get your Christmas groove on! ... Remind me to never say 'groove' again, guys. Kay. Less pop and probably a little more of a ballad in sound, White Angel is a pretty nice change of pace from the energetic and happy Merry x Merry Xmas★, yet still keeps in theme with the idea of Christmas. Making use of bells chiming in the background and a soft lull of piano at the very beginning, I feel like White Angel, as a song, is a little colder in feeling, and certainly brings to mind winter nights and furry hats. Wow, that is specific. Well, it's very pretty in sound, and feels a little more traditional, yet still modern enough as a song that it will interest people. In some ways, it reminds me of something like Silent Night. It's soft and appealing, airy and soothing, and it just feels like Christmas, from beginning to end. With its almost melancholy feel, I can't help but enjoy this song,. I love me a little bit of bitter in this world of sweetness and joy. Omnomnom, salt. I am so freakin' weird, lol. Of the three songs present on this single, I really do like White Angel, though I won't say it's my favourite. Some days, it's the kind of song I crave, but other days, I could easily live without it. Either way, I find it highly enjoyable, and I love the winter vibes it creates throughout. There is no denying that this is a Christmas track, and there is no way in hell I would deny the joy it brings me. The 'dance' track of the lot, Boom Boom Christmas is, admittedly, my least favourite of all the songs present on this single release. It's a bit too club for me, and whilst it does indeed contain some Christmas-type elements... this is actually one of few genres that can not completely encompass the Christmas feel, or at least, this dance-club style track can't. Again, though, there are points in this song that do contain a few Christmas type elements, such as jingling bells - I'm pretty sure there is a tambourine in there, too - and mentions of Christmas. Aside from that, though... it really doesn't scream Christmas, at least, not for me. I think that, if the right listener comes along, this would be a really good song, but it sounds a bit too much like Morning Musume circa 2014, for me. Still, I don't think it's a bad track, per say, but it certainly doesn't fit with the other two songs on the single. As E-girls are heavily dance orientated, though, I can see why it's in here, and I'm glad to see that they did try and diversify their sounds throughout, rather than sticking with a happy and sad theme. To wrap our 3rd Eve up and round those edges off, I want to say that, as a whole, I think that Merry x Merry Xmas★ is a good single, one that encompasses a few different Christmas tropes, and makes them work effectively in two of their songs, especially. It's an enjoyable release all around, and will certainly work in getting you into the Christmas spirit, if you're into that kind of thing. If not, it is, at the very least, a fun and energetic single with a good variety from beginning to end, and will appeal to a wide range of listeners. I would say that of the three songs, the weak point does seem to the be the final hurrah, and not because it lacks in impact or energy, but purely because it seems to only contain a fragment of that Christmas spirit the other two songs embody so damn well. At best, it feels like the 'Christmas' title has just been tacked on for good measure, so that they can market and play it as a Christmas tune during concerts. In its own right, though, it is a fun track, especially if you like the dance-club genre on its own.